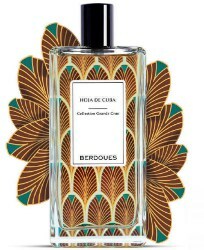 French perfume house Berdoues will launch Hoja De Cuba, a new addition to the Colognes Grand Crus collection. The last in the series was Maasaï Mara. Our perfumer, Ane Ayo, has travelled all through Cuban land. Through the precious know-how of tobacco leaf growth an authentic fragrance was created. She offers us through HOJA DE CUBA an interpretation of this authentic place. The unique blend of allspice from Jamaica, the vetiver from Haiti and the Turkish tobacco, reveals all the warm and tobacco character from the traditional manufacture of the famous Cuban cigars. Berdoues Hoja De Cuba will be available in 100 ml. It debuts this month. Yes! Hope this is as good as it sounds. oh boy am I in trouble!!!! and I still haven’t sampled the last two new releases! Hey, no rush, right? It ain’t going anywhere. And none of these are genius IMHO. I am perfectly happy with my Assam of India but also perfectly aware that if it were not in an elephant bottle it would not be worth owning. I’m so behind on the Berdoues, too I’m sad that I’ve moved away from their home town and no longer have super-easy access to sniffing them all. I don’t even know who carries them near me now, if anyone. A tip of the hat to the copywriter here who did not feel the need to descend to the “this fragrance is like an ode to newfound love, etc.” claptrap that accompanies so many releases. This sounds F-ing Fabulous! Surely a candidate for a ginormous sample. LOL! I want a decant when you do.